Pathogenesis of rheumatic heart disease (RHD) remains incompletely understood. 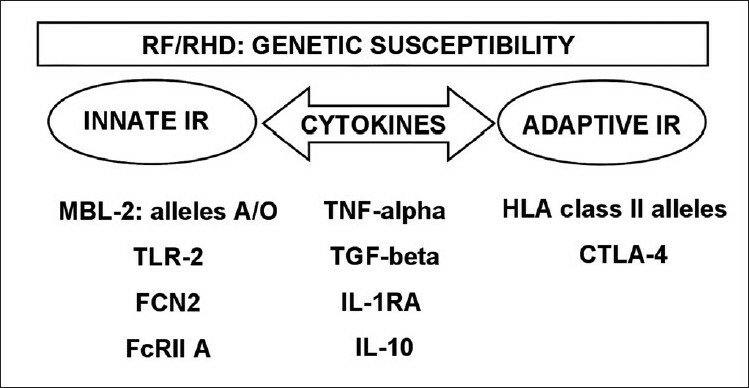 Several genes associated with RHD have been described; most of these are involved with immune responses. Single nucleotide polymorphisms in a number of genes affect patients with RHD compared to controls. Molecular mimicry between streptococcal antigens and human proteins, including cardiac myosin epitopes, vimentin and other intracellular proteins is central to the pathogenesis of RHD. Autoreactive T cells migrate from the peripheral blood to the heart and proliferate in the valves in response to stimulation with specific cytokines. The types of cells involved in the inflammation as well as different cytokine profiles in these patients are being investigated. High TNF alpha, interferon gamma, and low IL4 are found in the rheumatic valve suggesting an imbalance between Th1 and Th2 cytokines and probably contributing to the progressive and permanent valve damage. Animal model of ARF in the Lewis rat may further contribute towards understanding the ARF. In the present review, we focus on genetic susceptibility factors, their role in the development of RF and RHD, and the mechanisms that lead to autoimmune reactions and permanent valvular damage. Animal models of the disease will also be discussed, as will prospective vaccines for the prevention of RF and RHD. The molecules involved with both innate and adaptive immune responses described above are encoded by genes that are associated with RF/RHD [Figure 1] and will be discussed below. Similarly, MBL is a member of the lectin pathway of the complement system, as mentioned previously, and plays an important role in innate immune responses by promoting clearance of the bacteria. SNPs have been identified in the promoter region of the MBL2 gene (-550 H/L, -221X/Y and +4P/Q) and in exon 1 (codons 52A/D, 54A/B and 57A/D) and have been analyzed in patients with RF/RHD. Interestingly, different alleles were associated with different clinical pictures of the disease. RHD patients that developed mitral stenosis (MS) showed an association with the A allele (52A, 54A and 57A) that codes for high production of MBL, and this association correlated with high serum levels of MBL protein in most of the patients studied. Genotypes associated with high production of the protein (YA/YA and YA/XA) were more frequent in patients with acute and chronic carditis, when compared to the controls. In contrast, the majority of RHD patients that developed aortic regurgitation (AR) showed an association with the O allele (52D, 54B and 57D). The O allele codes for low production of MBL, and most of the patients studied had low serum levels of MBL. These results suggest that the MBL2 gene could play a role in the development of valvular lesions. Human leucocyte antigen (HLA) molecules are encoded by the HLA genes (-A, -B, -C, -DR, -DQ and -DP), which are located on the short arm of human chromosome 6. 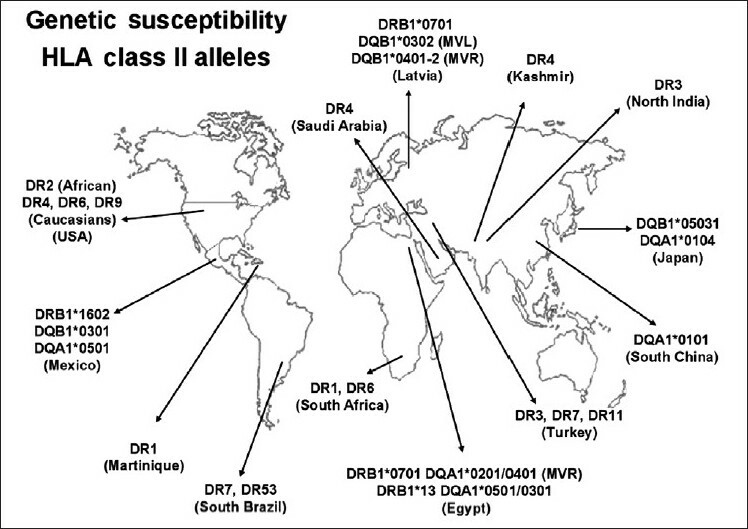 Early studies of susceptibility for RF/RHD pointed out the association of the disease with several HLA class II alleles, mainly those encoded by the DR and DQ genes. The molecular mechanism by which HLA class II molecules confer susceptibility to autoimmune diseases is not clear. As mentioned above, the role of HLA class II molecules is to present antigens to the TCR, leading to the recruitment of large numbers of CD4 + T cells that specifically recognize antigenic peptides from extracellular pathogens and the activation of adaptive immune responses. Therefore, the associated alleles probably encode molecules that facilitate the presentation of some streptococcal peptides to T cells that later trigger autoimmune reactions mediated by molecular mimicry. In summary, several alleles of the HLA class II genes appear to be the dominant contributors to the development of RF and RHD. Polymorphisms (SNPs and variable number of tandem repeat sequences of nucleotides) in genes involved with inflammatory responses and host defenses against pathogens that are associated with disease probably contribute to the development of valvular lesions and can determine the type of rheumatic valvular lesions (stenosis, regurgitation, or both) that occur in RHD patients. Using a proteomics approach, we showed that T cells recognize vimentin, further supporting the role of this protein as a putative autoantigen involved in rheumatic lesions. In addition, we identified myocardial and valvular autoantigens that were recognized by heart-infiltrating and peripheral T cells from RF/RHD patients. Novel heart tissue proteins were identified, including disulfide isomerase ER-60 precursor (PDIA3) protein and a 78-kDa glucose-regulated protein precursor (HSPA5). However, their role in RHD pathogenesis and other autoimmune diseases is not clear. As mentioned above, both epitope spreading and the degeneracy of T cell receptors contributed to the amplification of cross-reactivity that leads to tissue damage. The role of cytokines in RF/RHD was first evaluated by examining the sera of patients and peripheral mononuclear cells stimulated by streptococcal antigens. These samples showed increased amounts of proinflammatory cytokines (IL-1, IL-6, TNF-a and IFN-g). Immunohistochemistry on heart tissue (myocardium and valves) from acute and chronic RHD patients, showed a large number of mononuclear cells able to secrete TNF-a, IFN-g and the regulatory cytokine IL-10. Importantly, while a significant number of IL-4 + cells were found in the myocardium, these cells were very scarce in valve lesions in RHD patients. It is important to remember that valve damage and not myocarditis is the main problem in ARF. These observations indicated a role for balanced Th1/Th2 cytokines in healing myocarditis and in the induction of progressive and permanent valve damage. IL-17 and Il-23 (Th17 cytokines) were recently analyzed by immunohistochemistry in both myocardium and valvular tissue from RHD patients. We observed a large number of IL-17 + and IL-23 + heart-tissue infiltrating cells (unpublished results), showing that these cytokines also play an important role in the development of heart lesions. Thus the Lewis Rat model could be considered a model of autoimmune valvulitis akin to ARF. The greatest challenge for the development of a GAS vaccine resides in the promotion of immunity without generating cross-reactivity with human tissue. An effective and safe vaccine is still needed, most of all in developing countries. Several genes involved in the control of infection and the immune response play a role in the development of RF and RHD. Some genes are associated with the innate immune response, and others with the adaptive immune response. Many of these genes are responsible for the inflammatory process and autoimmune reactions. In rheumatic carditis, antibodies that cross-react with streptococcal and human proteins upregulate adhesion molecules, leading to inflammation and increased cellular infiltration. CD4 + T cells that cross-react with heart tissue and streptococcal antigens are the major effectors of heart lesions. Large numbers of mononuclear cells that infiltrate rheumatic heart lesions produce inflammatory cytokines (TNF-a and IFN-g) and the imbalance between these cells and the IL-4-producing Th2 cells in the valve tissue might contribute to the progression and maintenance of rheumatic valvular lesions. Th17 cells also play a role in the development of autoimmunity. Several pathogenic M protein epitopes were identified that can induce cross-reactive responses against human proteins. Both epitope spreading and TCR degeneracy increase the possibility of cross-reactivity between infectious agents and self antigens. An animal model of Lewis rat displays similar heart lesions to RHD and is considered a good model of the disease. The development of a vaccine against S. pyogenes is an important goal and, given the number of ongoing studies, will probably be a reality in the near future. 1. Carapetis JR, Steer AC, Mulholland EK, Weber M. The global burden of group A streptococcal disease. Lancet Infect Dis 2005;5:685-94. 2. Mota CC, Aiello DV, Anderson RH. Chronic rheumatic heart disease. In: Anderson RH, Baker EJ, Penny DJ, editors. Pediatric Cardiology. 3 rd ed. Philadelphia: Churchill Livingstone/Elsevier; 2009. p. 1091-133. 3. Bland EF, Duckett Jones T. Rheumatic fever and rheumatic heart disease: A 20 years report on 1000 patients followed since childhood. Circulation 1951;4:836-43. 4. Moser M, Leo O. Key concepts in immunology. Vaccine 2010;28:C2-13. 5. Akira S, Uematsu S, Takeuchi O. Pathogen recognition and innate immunity. Cell 2006;124:783-801. 6. Walport MJ. Complement. First of two parts. N Engl J Med 2001;344:1058-66. 7. Matsushita M. Ficolins: Complement-activating lectins involved in innate immunity. J Innate Immun 2009;2:24-32. 8. Sorensen R, Thiel S, Jensenius JC. Mannan-binding-lectin-associated serine proteases, characteristics and disease associations. Springer Semin Immunopathol 2005;27:299-319. 9. Runza VL, Schwaeble W, Männel DN. Ficolins: Novel pattern recognition molecules of the innate immune response. Immunobiology 2008;213:297-306. 10. Lynch NJ, Roscher S, Hartung T, Morath S, Matsushita M, Maennel DN, et al. L-ficolin specifically binds to lipoteichoic acid, a cell wall constituent of Gram-positive bacteria, and activates the lectin pathway of complement. J Immunol 2004;172:1198-202. 11. Berdeli A, Celik HA, Ozyürek R, Dogrusoz B, Aydin HH. TLR-2 gene Arg753Gln polymorphism is strongly associated with acute rheumatic fever in children. J Mol Med 2005;83:535-41. 12. Zhang P, Cox CJ, Alvarez KM, Cunningham MW. Cutting edge: Cardiac myosin activates innate immune responses through TLRs. J Immunol 2009;183:27-31. 13. de Messias-Reason I, Kremsner PG, Kun JF. Functional haplotypes that produce normal ficolin-2 levels protect against clinical leprosy. J Infect Dis 2009;199:801-4. 14. Messias-Reason IJ, Schafranski MD, Kremsner PG, Kun JF. Ficolin 2 (FCN2) functional polymorphisms and the risk of rheumatic fever and rheumatic heart disease. Clin Exp Immunol 2009;157:395-9. 15. Schafranski MD, Pereira FL, Scherner D, Torres R, Jensenius JC, de Messias-Reason IJ. High-producing MBL2 genotypes increase the risk of acute and chronic carditis in patients with history of rheumatic fever. Mol Immunol 2008;45:3827-31. 16. Ramasawmy R, Spina GS, Faé KC, Pereira AC, Nisihara R, Messias RI, et al. Association of mannose-binding lectin gene polymorphism but not of mannose-binding serine protease 2 with chronic severe aortic regurgitation of rheumatic etiology. Clin Vaccine Immunol 2008;15:932-6. 17. van de Winkel JG, Anderson CL. Biology of human immunoglobulin G Fc receptors. J Leukoc Biol 1991;49:511-24. 18. Yee AM, Phan HM, Zuniga R, Salmon JE, Musher DM. Association between FcgammaRIIa-R131 allotype and bacteremic pneumococcal pneumonia. Clin Infect Dis 2000;30:25-8. 19. Berdeli A, Celik HA, Ozyürek R, Aydin HH. Involvement of immunoglobulin FcgammaRIIA and FcgammaRIIIB gene polymorphisms in susceptibility to rheumatic fever. Clin Biochem 2004;37:925-9. 20. Miller LC, Gray ED, Mansour M, Abdin ZH, Kamel R, Zaher S, et al. Cytokines and immunoglobulin in rheumatic heart disease: Production by blood and tonsillar mononuclear cells. J Rheumatol 1989;16:1436-42. 21. Settin A, Abdel-Hady H, El-Baz R, Saber I. Gene polymorphisms of TNF-alpha(-308), IL-10(-1082), IL-6(-174), and IL-1Ra(VNTR) related to susceptibility and severity of rheumatic heart disease. Pediatr Cardiol 2007;28:363-71. 22. Yeðin O, Coþkun M, Ertuð H. Cytokines in acute rheumatic fever. Eur J Pediatr 1997;156:25-9. 23. Hajeer AH, Hutchinson IV. TNF-alpha gene polymorphism: Clinical and biological implications. Microsc Res Tech 2000;50:216-28. 24. Hernández-Pacheco G, Flores-Domínguez C, Rodríguez-Pérez JM, Pérez-Hernández N, Fragoso JM, Saul A, et al. Tumor necrosis factor-alpha promoter polymorphisms in Mexican patients with rheumatic heart disease. J Autoimmun 2003;21:59-63. 25. Ramasawmy R, Faé KC, Spina G, Victora GD, Tanaka AC, Palácios SA, et al. Association of polymorphisms within the promoter region of the tumor necrosis factor-alpha with clinical outcomes of rheumatic fever. Mol Immunol 2007;44:1873-8. 26. Sallakci N, Akcurin G, Köksoy S, Kardelen F, Uguz A, Coskun M, et al. TNF-alpha G-308A polymorphism is associated with rheumatic fever and correlates with increased TNF-alpha production. J Autoimmun 2005;25:150-4. 27. Morris K, Mohan C, Wahi PL, Anand IS, Ganguly NK. Enhancement of IL-1, IL-2 production and IL-2 receptor generation in patients with acute rheumatic fever and active rheumatic heart disease; a prospective study. Clin Exp Immunol 1993;91:429-36. 28. Narin N, Kütükçüler N, Ozyürek R, Bakiler AR, Parlar A, Arcasoy M. Lymphocyte subsets and plasma IL-1 alpha, IL-2, and TNF-alpha concentrations in acute rheumatic fever and chronic rheumatic heart disease. Clin Immunol Immunopathol 1995;77:172-6. 29. Guilherme L, Cury P, Demarchi LM, Coelho V, Abel L, Lopez AP, et al. Rheumatic heart disease: Proinflammatory cytokines play a role in the progression and maintenance of valvular lesions. Am J Pathol 2004;165:1583-91. 30. Chou HT, Chen CH, Tsai CH, Tsai FJ. Association between transforming growth factor-beta1 gene C-509T and T869C polymorphisms and rheumatic heart disease. Am Heart J 2004;148:181-6. 31. Kamal H, Hussein G, Hassoba H, Mosaad N, Gad A, Ismail M. Transforming growth factor-beta1 gene C-509T and T869C polymorphisms as possible risk factors in rheumatic heart disease in Egypt. Acta Cardiol 2010;65:177-83. 32. Azevedo PM, Bauer R, Caparbo Vde F, Silva CA, Bonfá E, Pereira RM. Interleukin-1 receptor antagonist gene (IL1RN) polymorphism possibly associated to severity of rheumatic carditis in a Brazilian cohort. Cytokine 2010;49:109-13. 33. Sabat R, Grütz G, Warszawska K, Kirsch S, Witte E, Wolk K, et al. Biology of interleukin-10. Cytokine Growth Factor Rev 2010;21:331-44. 34. Düzgün N, Duman T, Haydardedeoðlu FE, Tutkak H. Cytotoxic T lymphocyte-associated antigen-4 polymorphism in patients with rheumatic heart disease. Tissue Antigens 2009;74:539-42. 35. Guilherme L, Ramasawmy R, Kalil J. Rheumatic fever and rheumatic heart disease: Genetics and pathogenesis. Scand J Immunol 2007;66:199-207. 36. Bryant PA, Robins-Browne R, Carapetis JR, Curtis N. Some of the people, some of the time: susceptibility to acute rheumatic fever. Circulation 2009;119:742-53. 37. Guedez Y, Kotby A, El-Demellawy M, Galal A, Thomson G, Zaher S, et al. HLA class II associations with rheumatic heart disease are more evident and consistent among clinically homogeneous patients. Circulation 1999;99:2784-90. 38. Stanevicha V, Eglite J, Sochnevs A, Gardovska D, Zavadska D, Shantere R. HLA class II associations with rheumatic heart disease among clinically homogeneous patients in children in Latvia. Arthritis Res Ther 2003;5:R340-6. 39. Visentainer JE, Pereira FC, Dalalio MM, Tsuneto LT, Donadio PR, Moliterno RA. Association of HLA-DR7 with rheumatic fever in the Brazilian population. J Rheumatol 2000;27:1518-20. 40. Cunningham MW. Pathogenesis of group A streptococcal infections. Clin Microbiol Rev 2000;13:470-511. 41. Guilherme L, Kalil J. Role of autoimmunity in rheumatic fever. Fut Rheumatol 2008;3:161-7. 42. Guilherme L, Kalil J. Rheumatic fever and rheumatic heart disease: Cellular mechanisms leading autoimmune reactivity and disease. J Clin Immunol 2010;30:17-23. 43. Guilherme L, Köhler KF, Kalil L. Rheumatic Heart Disease: Mediation by complex immune events. In: Makoswki GS, editor. Advances in clinical chemistry. 53 th ed. Springfield: Elsevier; 2011. p. 31-50. 44. Peterson LK, Fujinami RS. Molecular mimicry. In: Shoenfeld Y, Gershwin ME, Meroni PL, editors. Autoantibodies. 2 nd ed. Burlington: Elsevier; 2007. p. 13-9. 45. Sercarz EE, Lehmann PV, Ametani A, Benichou G, Miller A, Moudgil K. Dominance and crypticity of T cell antigenic determinants. Annu Rev Immunol 1993;11:729-66. 46. Lehmann PV, Forsthuber T, Miller A, Sercarz EE. Spreading of T-cell autoimmunity to cryptic determinants of an autoantigen. Nature 1992;359:155-7. 47. Fischetti VA. Streptococcal M protein. Sci Am 1991;264:58-65. 48. Guilerherme L, Kali J, Cunningham M. Molecular mimicry in autoimmune pathogenesis of rheumatic heart disease. Autoimmunity 2006;39:31-9. 49. Guilherme L, Dulphy N, Douay C, Coelho V, Cunha-Neto E, Oshiro SE, et al. Molecular evidence for antigen-driven immune responses in cardiac lesions of rheumatic heart disease patients. Int Immunol 2000;12:1063-74. 50. Cunnigham MW. Autoimmunity and molecular mimicry in the pathogenesis of post streptococcal heart disease. Front Biosci 2003;8:s533-43. 51. Guilherme L, Weidebach W, Kiss MH, Snitcowsky R, Kalil J. Association of human leukocyte class II antigens with rheumatic fever or rheumatic heart disease in a Brazilian population. Circulation 1991;83:1995-8. 52. Raizada V, Williams RC Jr, Chopra P, Gopinath N, Prakash K, Sharma KB, et al. Tissue distribution of lymphocytes in rheumatic heart valves as defined by monoclonal anti-T cells antibodies. Am J Med 1983;74:225-37. 53. Kemeny E, Grieve T, Marcus R, Sareli P, Zabriskie JB. Identification of mononuclear cells and T cell subsets in rheumatic valvulitis. Clin Immunol Immunopathol 1989;52:225-37. 54. El-Demellawy M, El-Ridi R, Guirguis NI, Abdel Alim M, Kotby A, Kotb M. Preferential recognition of myocardial antigens by T lymphocytes from rheumatic heart disease patients. Infect Immun 1997;65:2197-205. 55. Faé KC, da Silva DD, Oshiro SE, Tanaka AC, Pomerantzeff PM, Douay C, et al. Mimicry in recognition of cardiac myosin peptides by heart-intralesional T cell clones from rheumatic heart disease. J Immunol 2006;176:5662-70. 56. Guilherme L, Oshiro SE, Faé KC, Cunha-Neto E, Renesto G, Goldberg AC, et al. T cell reactivty against streptococcal antigens in the periphery mirrors reactivity of heart infiltrating T lymphocytes in rheumatic heart disease patients. Infect Immun 2001;69:5345-51. 57. Yoshinaga M, Figueiroa F, Wahid MR, Marcus RH, Suh E, Zabriskie JB. Antigenic specificity of lymphocytes isolated from valvular specimens of rheumatic fever patients. J Autoimmun 1995;8:601-13. 58. Faé KC, Kalil J, Toubert A, Guilherme L. Heart infiltrating T cell clones from a rheumatic heart disease patient display a common TCR usage and a degenerate antigen recognition pattern. Mol Immunol 2004;40:1129-35. 59. Faé KC, Diefenbach da Silva D, Bilate AM, Tanaka AC, Pomerantzeff PM, Kiss MH, et al. PDIA 3, HS PA5, and Vimentin, proteins identified by 2DE in the valvular tissue, are target antigens of peripheral and heart infiltrating T cells from chronic rheumatic heart disease patients. J Autoimmun 2008;31:136-41. 60. Stockinger B, Veldhoen M, Martin B. Th17 T cells: Linking innate and adaptive immunity. Semin Immunol 2007;19:353-61. 61. Dong C. Diversification of T-helper-cell lineages: Finding the family root of il-17 producing cells. Nat Rev Immunol 2006;6:329-33. 62. Guilherme L, Faé K, Oshiro SE, Kalil, J. Molecular pathogenesis of rheumatic fever and rheumatic heart disease. Expert Rev Mol Med 2005;7:1-15. 63. Unny SK, Middlebrooks BL. Streptococcal rheumatic carditis. Microbiol Rev 1983;47:97-120. 64. Kodama M, Matsumoto Y, Fujiwara M, Masani F, Izumi T, Shibata A. A novel experimental model of giant cell myocarditis induced in rats by immunization with cardiac myosin fraction. Clin Immunol Immunopathol 1990;57:250-62. 65. Wegmann KW, Zhao W, Griffin AC, Hickey WF. Identification of myocarditogenic peptides derived from cardiac myosin capable of inducing-experimental allergic myocarditis in the Lewis rat. J Immunol 1994;153:892-900. 66. Li Y, Heuser JS, Kosanke SD, Hemric M, Cunningham MW. Cryptic epitope identified in rat and human cardiac myosin S2 region induces myocarditis in the Lewis rat. J Immunol 2004;172:3225-34. 67. Cunningham MW. T cell mimicry in inflammatory heart disease. Mol Immunol 2004;40:1121-7. 68. Quinn A, Kosanke S, Fischetti VA, Factor SM, Cunningham MW. Induction of autoimmune valvular heart disease by recombinant streptococcal M protein. Infect Immun 2001;69:4072-8. 69. Lymbury RS, Olive CO, Powell KA, Good MF, Hirst RG, Labrooy JT, et al. Induction of autoimmune valvulitis in lewis rats following immunization with peptides from the conserved region of group A streptococcal M protein. J Autoimmun 2003;20:211-7. 70. Gorton D, Blyth S, Gorton JG, Govan B, Ketheesan N. An alternative technique for the induction of autoimmune valvulitis in a rat model of rheumatic heart disease. J Immunol Methods 2010;355:80-5. 71. Gorton D, Govan B, Olive C, Ketheesan N. B- and T-cell responses in group A Streptococcus M-protein- or peptide-induced experimental carditis. Infect Immun 2009;77:2177-83. 72. Cunningham MW, Antone SM, Smart M, Liu R, Kosanke S. Molecular analysis of human cardiac myosin-cross-reactive B- and T-cell epitopes of the group A streptococcal M5 protein. Infect Immun 1997;65:3913-23. 73. Steer AC, Batzloff MR, Mulholland, Carapetis JR. Group A streptococcal vaccines: facts versus fantasy. Curr Opin Infect Dis 2009;22:544-52. 74. Hu MC, Walls MA, Stroop SD, Reddish MA, Beall B, Dale JB. Immunogenicity of a 26-valent group A streptococcal vaccine. Infect Immun 2002;70:2171-7. 75. McNeil SA, Halperin SA, Langley JM, Smith B, Warren A, Sharrat GP, et al. Safety and immunogenicity of 26-valent group a streptococcus vaccine in healthy adult volunteers. Clin Infect Dis 2005;41:1114-22. 76. Dale JB, Penfound T, Chiang EY, Long V, Shulman ST, Beall B. Multivalent group A streptococcal vaccine elicits bactericidal antibodies against variant M subtypes. Clin Diagn Lab Immunol 2005;12:833-6. 77. Bessen D, Fischetti VA. Passive acquired mucosal immunity to group A streptococci by secretory immunoglobulin A. J Exp Med 1988;167:1945-50. 78. Bessen D, Fischetti VA. Synthetic peptide vaccine against mucosal colonization by group A streptococci. I. Protection against a heterologous M serotype with shared C repeated region epitopes. J Immunol 1990;145:1251-6. 79. Batzloff MR, Yan H, Davies MR, Hartas J, Lowell GH, White G, et al. Toward the development of an antidisease, transmission-blocking intranasal vaccine for group A Streptococcus. J Infect Dis 2005;192:1450-5. 80. Olive C, Hsien K, Horváth A, Clair T, Yarwood P, Toth I, et al. Protection against group A streptococcal infection by vaccination with self-adjuvanting lipid core M protein peptides. Vaccine 2005;23:2298-303. 81. Vohra H, Dey N, Gupta S, Sharma AK, Kumar R, McMillan D, et al. M protein conserved region antibodies opsonise multiple strains of Streptococcus pyogenes with sequence variations in C-repeats. Res Microbiol 2005;156:575-82. 82. Simerska P, Abdel-Aal AB, Fujita Y, Moyle PM, McGeary RP, Batzloff MR, et al. Development of a Liposaccharide-Based Delivery System and Its Application to the Design of Group A Streptococcal Vaccines. J Med Chem 2008;51:1447-52. 83. Olive C, Schulze K, Sun HK, Ebensen T, Horváth A, Toth I, et al. Enhanced protection against Streptococcus pyogenes infection by intranasal vaccination with a dual antigen component M protein/SfbI lipid core peptide vaccine formulation. Vaccine 2007;25:1789-97. 84. Guilherme L, Faé KC, Higa F, Chaves L, Oshiro SE, Freschi de Barros S, et al. Towards a vaccine against rheumatic fever. Clin Dev Immunol 2006;13:125-32. 85. Guilherme L, Alba MP, Ferreira FM, Oshiro SE, Higa F, Patarroyo ME, et al. Anti-group A streptococcal vaccine epitope: Structure,stability and its ability to interact with HLA class II molecules. J Biol Chem 2011;286:6989-98. 86. Guilherme L, Postol E, Freschi de Barros S, Higa F, Alencar R, Lastre M, et al. A vaccine against S. pyogenes: Design and experimental immune response. Methods 2009;49:316-21. Postol, E. and Alencar, R. and Higa, F.T. and Freschi de Barros, S. and Demarchi, L.M.F. and Kalil, J. and Guilherme, L.
Imperato, P.J. and Imperato, A.C. and Imperato, G.H.